Save up to 15% off selected cabins. Book now! Save up to 20% off selected cabins. Book now! With a polar bear population that exceeds that of humans, a visit to Svalbard is any wildlife lover’s dream. Turn that dream into a reality with Aurora Expedition’s Svalbard Odyssey voyage. Here, travellers can soak in endless daylight and experience a world of adventure, while searching for the majestic Polar bear of course! As well as the king of the Arctic, expeditionists can witness beluga whales, walrus, bearded seals and plenty of bird life while exploring these parts. With a flexible schedule and smaller group numbers, we can make the most of spontaneous opportunities to get you closer to the action! Arrive in Longyearbyen, where you will be met by a representative of Aurora Expeditions and taken on a sightseeing tour to explore the remote outskirts and ‘Capital’ of Spitsbergen, including a stop at the local museum. 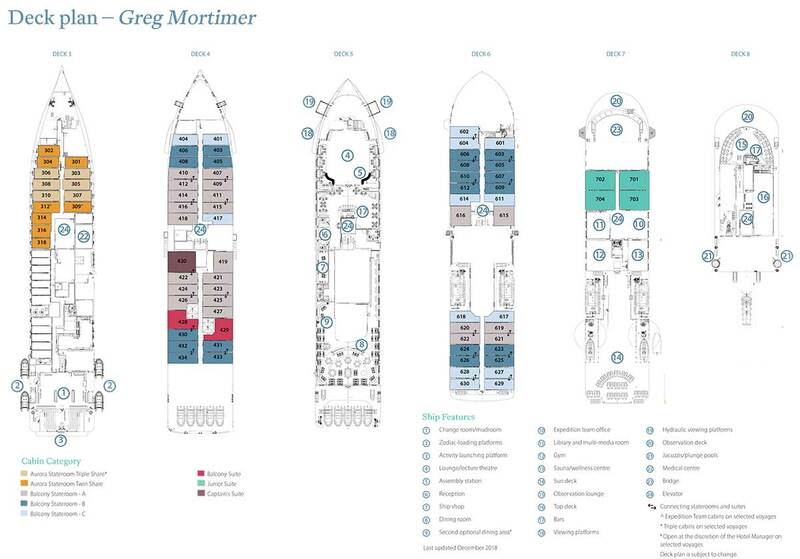 After the tour you will be transferred to the port in the late afternoon to embark the Greg Mortimer. You’ll have time to settle into your cabin prior to the important pre-departure briefings. Your voyage commences, cruising out of the beautiful Isfjorden, escorted by gliding fulmars and perhaps the occasional puffin. Find a spot on one of the observation areas watching for seabirds, including graceful ivory gulls, kittiwakes and guillemots. They rise and fall skilfully, using the air currents created by the ship to gain momentum. NOTE: Sometimes our ship is unable to dock in Longyearbyen port due to space and capacity. In these instances, we reach the ship by Zodiac. Please ensure that you keep your wet-weather gear in your hand luggage to use in the Zodiacs if the situation arises. Our crew w deliver your luggage separately to your cabin. Please ensure all your luggage has your cabin tag/number attached. Over the next ten days, the Svalbard Archipelago is ours to explore. Our experienced expedition team, who have made countless journeys to this area, will use their expertise to design our voyage from day to day. This allows us to make best use of the prevailing weather, ice conditions and wildlife opportunities. In this area we find the former mining settlement of Ny-Ålesund. Situated at 78º 55' N, Ny-Ålesund is one of the world’s northern-most year-round communities. The settlement of Ny-Ålesund is strongly linked to coal mining operations, scientific expeditions and recently also to various international research efforts. It is located more than 100 km north of Longyearbyen and is one of the northernmost settlements in the world. In and around Ny-Ålesund is found the largest concentration of protected buildings, cultural monuments and various remains in Svalbard, rendering the place an important cultural heritage site. The cultural history is represented by the town itself, including 30 listed buildings (out of 60 in total), industrial monuments related to the coal mining operations, Roald Amundsen’s airship mooring mast and hangar foundation and some remains of research activities. Ny-Ålesund is the largest Norwegian settlement in Svalbard that was not set fire to during World War II. The settlement is well preserved and worth experiencing and serves as a valuable historical source. Ny-Ålesund has also been the starting point of several historical attempts to reach the North Pole. Names like Amundsen, Ellsworth and Nobile are strongly linked to Ny-Ålesund. The place has been a centre for tourist operations, with several hotels located in town. Today, approximately 20,000 travellers visit Ny-Ålesund on a yearly TRIP NOTES basis. Since 1964, Ny-Ålesund has also been a centre for international Arctic research and environmental monitoring. A number of countries run their own national research stations here, and research activity is high in the summer. The islands and islets in the inner part of Kongsfjorden teem with birds. At the head of the fjord, mighty glaciers calve into the sea. All of this is framed by characteristic mountain formations. Situated at the north side of the fjord, London is a monument to past optimistic expectations for big money from the supply of marble to the world market. Further north-west lies Krossfjorden, with its cultural remains from the whaling period, Russian and Norwegian overwinterings and World War II. Large bird cliffs are also found here. It was here, in the far north-west, that Willem Barentsz and his crew discovered new land on 17 June,1596. They described the land as being “rugged for the most part, and steep, mostly mountains and jagged peaks, from which we gave it the name of Spitsbergen”. In the centuries that followed, the large number of bowhead whales found here attracted whalers from the Netherlands and various other countries, and the area became a place of high activity, both on the shore and in the surrounding sea. This is why Nordvesthjørnet offers the largest concentration of graves, blubber ovens and other cultural treasures on Spitsbergen, all dating back to this first era of the exploitation of Svalbard’s natural resources. Virgohamna is one of Svalbard's most important cultural heritage sites. On the beach are remais of blubber ovens and a Dutch whaling station. There are also graves from the whaling period. But Virgohamna is most famous for being the starting place of many an expedition attempting to reach the North Pole. Both Andrée (1896, 1897) and Wellman (1906, 1907, 1909) built bases here, consisting of a balloon shed, airship hangars and gas production works. TRIP NOTES The place was named after Andrée's steamship and transport vessel, the Virgo. All the areas with cultural remains in Virgohamna are protected. To disembark here, one must have written permission from the Governor of Svalbard. Ytre Norskøyais situated in the middle of what used to be the Dutch whaling area in the early 1600s, when it all revolved around land-based stations for boiling the whale blubber. The station is situated by the sound Norskøysundet, between the islands of Ytre Norskøya and Indre Norskøya. A sheltered bay offers protection against the weather and a broad beach facilitates landings. Today, the remains of nine blubber ovens lie in a line along the beach in the bay. The area with 165 graves on the island is one of the largest burial grounds in Svalbard. Located along the north coast, Woodfjorden, Liefdefjorden and Bockfjorden are rarely-visited places. This is the land of contrasts. By the large, flat Reinsdyrflya there is a great fjord system that stretches towards several mountain ridges of varying shapes and ages, including alpine summits of very old granite, majestic red mountains of Devonian sandstone, cone-shaped remnants of three volcanoes and even hot springs. Large glacier fronts calve in the sea, while polar bears are busy hunting for ringed seals and sweeping the islets for birds’ eggs. Walk on smooth raised beach terraces to a superb viewpoint or hike in the mountains on the tundra where pretty brightly coloured wild flowers and lichen grow and where reindeer graze. We may visit trapper huts of yesteryear where Russian Pomors would hunt and survive the cold harsh winters, all while remaining alert for wandering polar bears and their cubs. Nordaust-Svalbard Nature Reserve is the most high-Arctic part of Svalbard. The fjords are covered in ice, and drift ice floats around the islands for most of the year. Glaciers cover large areas of the terrain. This is the kingdom of the polar bear and walrus. It has been protected as a nature reserve since 1973.Nordaustlandet is the second largest island in Svalbard, with an area of 14,443 km². It is part of Nordaust-Svalbard Nature Reserve. The two large ice sheets of Austfonna and Vestfonna cover large areas of the island. The landscape is open and majestic with different types of landscapes, from the prominent fjords in the west and north to the massive glacier front facing east and south. From a distance, Nordaustlandet appears cold, unfriendly and unproductive. However, many places are unexpectedly lush, especially close to the bird cliffs. The vegetation on land and the production in the sea have together formed a foundation for the terrestrial and marine wildlife, creating hunting opportunities for people. There are fewer signs of human activity on Nordaustlandet than in the rest of Svalbard, although there are cultural remains from Russian and Norwegian overwintering trapping, from scientific research and expeditions and from WorldWar II. A research station in Kinnvika in Murchisonfjorden dates from the International Geophysical Year 1957-1958. A wartime memory can also be found on Nordaustlandet in the form of Station Haudegen, the German weather station in Rijpfjorden. There is a traffic ban in the near vicinity of this station. And it was on the island of Kvitøya that the story of the Andrée expedition and its mysterious disappearance and tragic end were finally unravelled. MoffenIslandis situated directly north of 80°N. After the near-extinction of walrus in Svalbard in the middle of the 20th century, Moffen Island played an important role in re-establishing the species here, a process which is still going on. Today, there are often larger numbers of walrus hauled out at the southern tip of the island. This is the reason why Moffen is protected. Approach during the summer (15th May to 15th September) is limited to a minimum distance of 500 metres/ 1,640 feet. In the very north of Svalbard, in the ocean north of Nordaustlandet, is the little archipelago of Sjuøyane (the seven islands), with its characteristically hat-shaped mountains. The hard granite mountains have acquired a green covering of moss due to thousands of breeding seabirds. Walrus dive for clams in the waters between the islands and in the bays. Most of the islands have been named after the English North Pole expeditions led by Phipps (1773) and Parry (1827). Sjuøyane are located at about80°45′N. The mountains, of gneiss and granites, are tied together by plains created by deposits, which have given the islands their large, semi-circular bays. In general, the sparse vegetation belongs to the Arctic polar desert zone. However, fertilisation by bird droppings provide a breeding ground for mosses and scurvygrass (Cochlearia groenlandica), which give some of the mountains their characteristic greenish colour. When the ice breaks up around Sjuøyane and the first seabirds return in April–May, the islands wake again after a long winter, during which the only wildlife is the odd polar bear, Arctic fox, reindeer and walrus. There is a large number of bird cliffs in Sjuøyane, scattered around most of the islands. Little auks come in the largest numbers, but there are also several smaller colonies of Atlantic puffins and Brünnich’s guillemots. Common guillemots nest scattered around the islands. One of the few known colonies of ivory gulls can be found on Phippsøya. Ivory gulls are categorized as listed as a Near Threatened Species. There are also several haul-out sites for walrus on Sjuøyane. The most reliable place to encounter them is Isflakbukta on the island of Phippsøya. Up to 100 animals can be seen on the beach, and normally walrus are very active in the shallow bay. Along the northeast coast of Spitsbergen we enter a different world –a polar desert. If ice conditions allow we will pass south through the narrow Hinlopen Strait. The strait is flanked by creamy coloured slabs of rock that are rich in fossils, as we will discover for ourselves when we go ashore. We may visit Alkefjelletin the Strait, where a series of one-hundred-metre-high dolerite towers are home to nearly a million nesting Brünnich’s guillemots –the penguins of the north –that occupy every available nook and cranny. Elsewhere we seek out eider ducks and geese and hope to spot Arctic fox and the beautiful ivory gulls. Polar bears are common in the Hinlopen are Normally a few summer bears can be spotted on the islands in Hinlopen Straitor around the bird cliffs. In spring, Hinlopen Strait is full of life, when the seabirds return. There is lots of noise out in the sound, as the little auk, Brünnich’s guillemot and northern fulmar all make their presence known. Most birds go to the western part of Hinlopen Strait: from Lomfjordenand southwards. Alkefjelletto the south of Lomfjordenis the largest bird cliff in the area with several hundred thousand black-legged kittiwakes and as many Brünnick’s guillemots. There are also several colonies of northern fulmar in the area, and little auks nest scattered in Hinlopen Strait. Brünnich’s guillemots nest in many colonies, including on the island of Wahlbergøya. Black-legged kittiwakes and black guillemots also breed in several of the colonies, most of them west of Hinlopen Strait but also around Wahlenbergfjorden. One of the colonies is on Selanderneset. Common eiders also nest in many places, but the locations have been very poorly mapped. However, there is known to be a large colony on the island of Lemströmøya, north of ahlbergøya. Several of the most famous and most visited haul-out sites for walrus can be found in Hinlopen Strait. Worth mentioning are Augustabukta/Torellnesetand Vibebukta. White whales, ringed seals and bearded seals also occur in the area. The abundance of reindeer in the area varies greatly. The density is highest where the vegetation is most pronounced, such as the inner parts of Lomfjorden, at the bottom of Wahlenbergfjorden, in Palanderdalenand on Scaniahalvøya. A smaller number of reindeer are also scattered around the islands in HinlopenStrait, and the Arctic fox can be seen on both sides of the strait. There is no doubt that the easiest place to observe foxes is around the bird cliffs. This is often also where dens can be found so we avoid entering these areas. East of Spitsbergen are two large islands called Barentsøya and Edgeøya. The area has a rich wildlife, especially when it comes to polar bears, reindeer, walrus, seabirds and geese. In the west of Edgeøya there are cultural remains from European whaling. Edgeøya and Tusenøyane were the main area for Russian overwintering hunting between 1700 and 1850. Traces of Norwegian overwintering hunting as well as newer scientific research can also be found. The area has been a nature reserve since 1973. The beautiful fertile plains of Sundenesetand the areabetween Spitsbergen and the smaller islands of Barentsøya and Edgeøya, area major polar bear migration route. The spongy ground is richly covered with bright green mosses, a variety of delicate and colourful flowers, particularly the yellow marsh (bog) saxifrage, various mushrooms, fungi, clear bubbling streams and small tarns. Tiny (micro) flowers such as Mouse Ears grow in Spitsbergen creating faerie like mossy rock gardens. We explore this beautiful terrain on foot, marvelling at the contrast between the colourful soft ground and the barren, rocky terrain from further north. Reindeer antlers lie scattered along the ground. Alkhornet, at the northern entrance of Isfjorden, is a striking landmark. The landscape around this large bird cliff is lush and beautiful. East of Alkhornet you can find a deep and several kilometre long bay with an exciting and diverse history. Here you will find important and vulnerable cultural remains dating from several of Svalbard’s historical periods. Alkhornet and Trygghamnaoffer visitors an interesting combination of cultural history and natural environment. The name Trygghamna is derived from the old Dutch name Behouden Haven and the English Safe Harbour or SafeHaven, all with the same meaning. The name reflects on the West European whaling that was carried out around Svalbard in the 17th century when whales would swim into the fjords and subsequently be caught. Trygghamna was, and still is, the perfect harbour with good anchorage. Because of its favourable geographical position, this harbour was early known and continuously in use. At Alkhornet, reinde reservations are common, there are several fox dens, geese nest on rocks and higher up, and the bird cliff is loaded with Brünnich’s guillemots in hundreds of thousands. The cliff also houses a large colony of kittiwakes. Often seen is the glaucous gull patrolling the air around the cliff for potential prey. Arctic skuas nest here as well. The moss tundra below the cliffs bear witness of constant influx of fertilizers and some areas are extraordinary lush for this reason. Majestic peaks and dramatic fjords make a visit to Hornsund special. The highest summits are often shrouded in mist, but if you are lucky you might get a glimpse of Hornsundtind, peaking at 1,431 metres / 4,695 feet. Hornsund is the southernmost fjord in Svalbard located in Sør-Spitsbergen National Park. Traces of human activity spanning 400 years can be found almost anywhere where there are possible landing sites. With regards to birdlife, Hornsund is mainly the domain of the little auks, due to the large scree slopes –their typical nesting habitat. With abundant plankton and crustaceans, Hornsund and the areas off the west coast represent a giant food reservoir for the little auk. The West Spitsbergen Current –a branch of the Gulf Stream –brings temperate waters north along the western Spitsbergen coast and provides favourable conditions for biological production in the area. Northern fulmar can be seen in several colonies in Hornsund. Brünnich’s guillemot and kittiwake nest at the same locations. Dunøyaneand Isøyaneare important nesting areas for barnacle geese, and the islands were protected as bird sanctuaries back in 1973. The sanctuaries and the strand flats on the west coast are important migrating localities for barnacle geese, pink-footed geese and brent geese. Pink-footed geese nest in large numbers on Dunøyane and on scree slopes and hillsides close to the sea, including in Hyttevikanorth of Hornsund and Gnålodden. In June, traffic in these areas can easily scare birds off the nest and leave the eggs unprotected and open for nest-plunderers like the glaucous gull and Arctic fox. Eider ducks nest in the sanctuaries and at most headlands and islets in the Hornsund area, including the islets off Gnålodden, at Hornsundneset, in Steinvika and Hyttevika. A huge colony of little auks is situated at Ariekammen(100,000 to 1 million individuals) and is probably the largest in Svalbard. If you have ever been close to such a large colony when the little auks are swarming you will never forget it. There are not many reindeer in the Hornsund area. The reindeer is mainly associated to the strand flats and valleys on the west coast and inside the fjords. The strand flats are important winter habitats, but are prone to icing (warm weather and above-zero temperatures, followed by cold weather), which makes food hard to reach. These episodes reduce reindeer numbers dramatically from time to time. The Hornsund area sustains a solid population of Arctic fox. Bellsundcuts into Spitsbergen south of Isfjorden and splits into two branches: the fjords Van Mifjorden and Van Keulenfjorden. The landscape around here is characterized by high mountains where different geological structures can be seen clearly, including impressive folds. There are large bird cliffs in the area; fertilization by seabird droppings accounts for the surprisingly lush vegetation in some areas. The area holds cultural remains from several periods of Svalbard’s history, the most prominent being the era of mineral exploration and mining at the beginning of the 20th century. Crossing the Barents Sea to Kirkenes offers some good opportunities to encounter whales and certainly plenty of opportunities to photograph sea birds. You may enjoy final presentations from our team of experts, spend your time editing photos or simply relaxing. During the early morning we cruise into the Bokfjord towards Kirkenes. Farewell your expedition team and fellow expeditioners as we all continue our onward journeys. A transfer is included to the airport. 07 Jul 2021 - 19 Jul 2021 $12600 AUD Save up to 25% off selected cabins. Subject to availability., Save up to 15% off selected cabins. Book now!, Save up to 20% off selected cabins. Book now! Triple Cabin $12600 AUD Save up to 25% off selected cabins. Subject to availability. 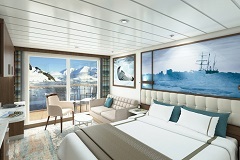 $13345 AUD Save up to 15% off selected cabins. Book now! 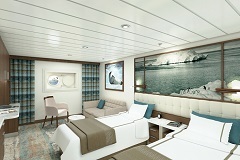 $17595 AUD Save up to 15% off selected cabins. Book now! 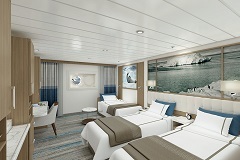 $19120 AUD Save up to 20% off selected cabins. Book now! Please refer to this itinerary as a guide only, as changes may occur due to unpredictable sea and weather conditions. Flexibility is key, when joining us on our expeditions.